Before introducing the House of Rabbit, let me first explain some important codes that will be used. The whole test is run on Kali with glibc-2.24. 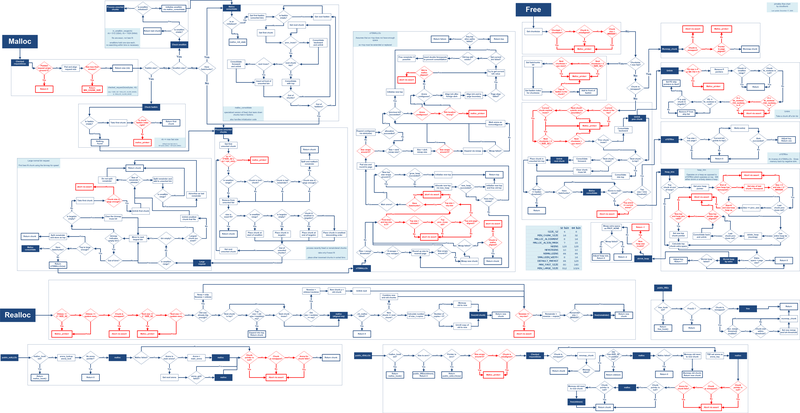 The malloc parameter mp_ is a global variable, which defines the maximum size of mapped memory. Let me use the following snippet of code to explain. Another interesting observation of the sample code is that the return value, i.e. the allocated memory are located in different area. To explain what happens, let me use strace first to see the syscall used of the sample code. From the output above, we can see that the first heap is actually allocated through mmap syscall, and the second heap is allocated through brk syscall in the end. More details of this operation is located in the sysmalloc function, I may give another post on sysmalloc in future. For now, getting to know the difference of the two allocation is enough. Let me review the trigger condition of malloc_consolidate from . During the process of free, if the size is larger than or equal to 0x10000, the function malloc_consolidate will be triggered. The goal of malloc_consolidate is to put the separated chunks in fast bin into unsorted bin. With the background knowledge introduced in the previous section, we know that after #2 free, we now have a heap chunk of size 0xa01000. Now, we have a fake chunk (0x601090) under attacker’s control in the unsorted bin. The next step is move the fake chunk into the large bin in the same way as discussed in A Revisit to Large Bin. To avoid the integrity check in iterating over the unsorted bin, we need to modify the size of fake chunk to 0xa0000. At this time, the attack can trigger #7 malloc to get a chunk at known address and launch the attack. Since this technique is limited because a buffer with known address is necessary for launching the attack. In principle, this technique can return a chunk at any given address. However, with the situation that base address of most libraries are randomized, only the address in given binary (with ASLR disabled) is available for attacker to use.